“Sagip Kalusugan” is a continuing effort of Sagip Kapamilya in areas devastated by calamities. On March 2015, it has successfully completed the Feeding program in nine schools namely: Lagro ES and North Fairview ES in Quezon City, Capas Gabaldon ES and Paniqui North Central ES in Tarlac, Suarez Central School, Iligan City North 1 Central School and Kalamalamahan ES in Iligan City, Solana ES and Opol Central ES in Misamis Oriental. 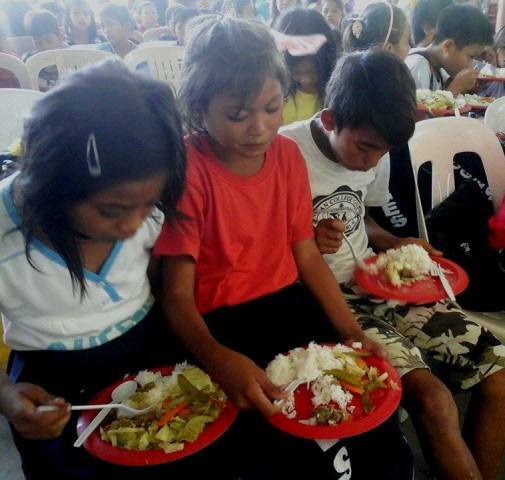 The Feeding Program resulted in the normalization of 2,735 severely wasted and wasted pupils. But more than just filling the empty stomachs of the children, the 120 day feeding program brought better change to the lives of the beneficiaries. From pale cheeks and thin, weak bodies: turned into lively, healthy and happy children. Sagip Kapamilya was able to accomplish these results because of the partnership with DepEd, LGU and the communities involving the volunteer parents. Sagip Kapamilya did not just enhance the role of the parents by merely cooking the children’s meals in school, but also broaden their partnership in continuing the advocacy of Sagip Kalusugan in addressing malnutrition by bringing it in their homes. Once Again, Sagip Kapamilya fulfilled and served its purpose of helping and supporting Kapamilya not just in times of disaster but also in times of need.